Arrives before Christmas. Style Name: 6-18x44 - V-brite Illuminated Moa 4-12x40 - Dead-hold Bdc Moa $164.93 4-12x50 - Dead-hold Bdc Moa $179.99 6-18x44 - Dead-Hold BDC MOA $189.97 6-18x44 - V-brite Illuminated Moa $249.99 6-18x44 - V-plex Moa $194.99 The 6-18x44 Adjustable Objective Crossfire II riflescope is one of many configurations in the Crossfire II line. The V-Brite reticle uses battery-powered electronics to illuminate the center dot for hunters/shooters during extra-low light conditions. 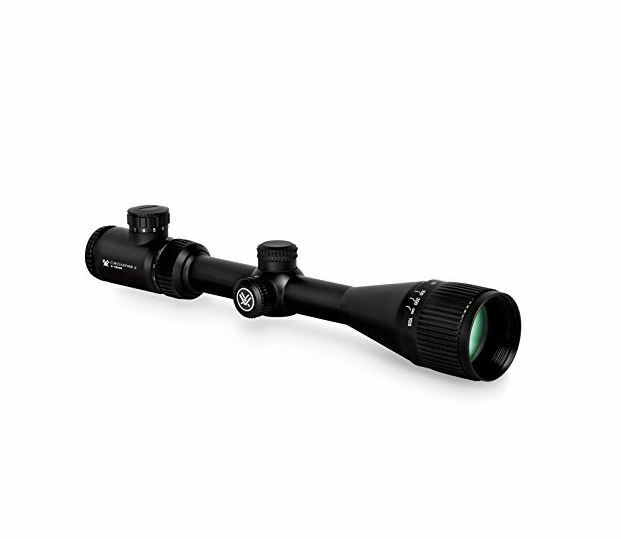 The adjustable objective provides image focus and parallax removal to the shooter while anti-reflective, fully multi-coated lenses provide bright and clear views. With long eye relief and an ultra-forgiving eye box, you'll be able to quickly get a sight picture and acquire your target. The fast focus eyepiece allows quick and easy reticle focusing. Capped reset turrets are finger adjustable with MOA clicks that can be reset to zero after sighting in. A single piece tube constructed from aircraft grade aluminum ensures strength and shockproof performance. O-ring sealed and nitrogen purged, the Crossfire II delivers waterproof and fogproof performance.